The miniboots kit and Aiken amp. I may have received one of the last miniboots kits as the kit was discontinued soon after I ordered mine. 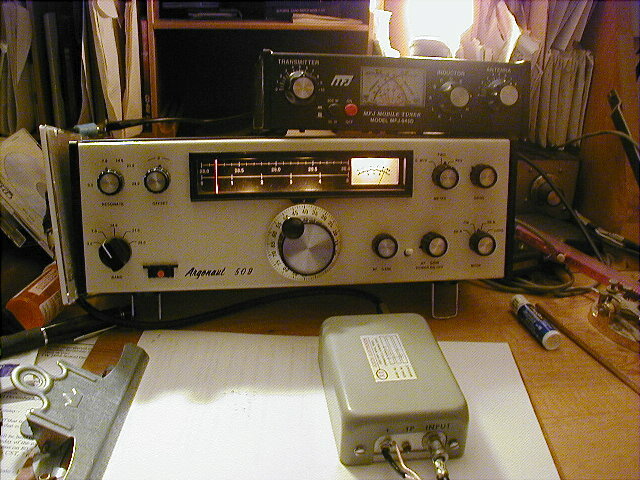 I was hoping for a bit more power than provided by my Argonaut 509 on the 80 and 40 meter bands. Although not my original plan, I located this AIKEN Electronics amplifier in my junk box in the basement. I had always thought this unit would make a nice small amp. It mechanically had heatsinking for 4 TO-39 type devices. 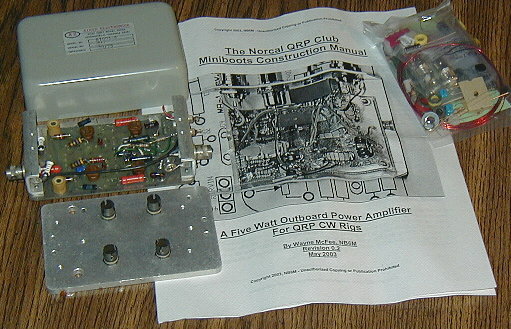 After receiving the Miniboots, the enclosure I had purchased at Radio shack was on the large size for such a small board. It was then I looked for the Aiken amp and saw it looked like a good fit. It hurt a little to remove the TO-39 heatsinks as the Aiken was nicely engineered. 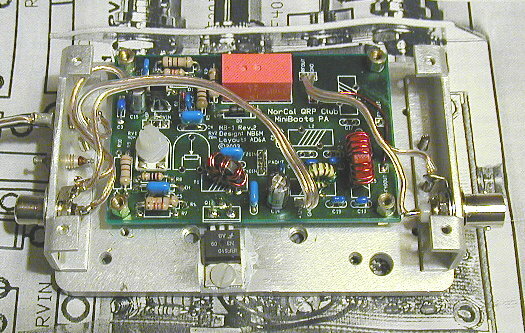 The miniboots as provided is designed for 40 and 20 meters at 5 watts out. I wanted 80 and 40 meters and was hoping for 15 to 20 watts out. I built up just the 40 meter part of the kit and mounted it in the Aiken unit to try it out. You may notice in the picture that I somehow got the wires on the wrong side of the output transformer. ( It seems to make a difference how you start winding.) I installed the FET through the bottom of the board and soldered the leads after the mechanical parts were tightened. This seems to work very well. I put an RCA jack on the input: the Argo uses RCA jacks for the RF output. I don't seem to build many things stock. The design was fine as is. The power output was a little lower than what I wanted, so I rewound the output transformer as a 9:1 ( vs the existing 4:1 ). This provided a bit more output before saturation. The input circuit had a 12 volt zener and 10 ohm resistor to provide overdrive protection. This circuit also provided self bias to the gate as the amp is driven with RF. When adjusting the drive on the Argonaut, I noticed that I would get zero output until a certain level was reached and then the output would go to max with very little increase in drive. So I replaced the 10 ohm resistor with another zener to provide back to back zeners on the input. This change keeps the amp in class C and it does not produce any self bias. The amp was no longer touchy on the drive, but I could no longer drive it to max power with the Argonaut. So I removed the 33 ohm gate swamping resistor and replaced it with the 100 ohm resister that I hadn't yet installed. I was pleased with the drive behavior now. I have since added an 80 meter filter and switch for the output filters. I did not install the 2nd input antenuator section as I can adjust the drive with the Argonaut drive control. I also added a power switch as outlined in the manual to be able to easily switch the unit offline. Maybe I will do someday. The Argonaut provides a T voltage on the rear panel and the Aiken has an unused feedthrough labeled tp. This looks like a good way to add bias to use the amp in a linear mode. The T voltage could also be used to switch the relay, so the unit would stay in transmit mode when the T voltage is present. It might also be interesting to restore the self bias circuit and see if the unit might be linear at a certain drive level. This would be very simple and would work for psk31 or rtty type operation where the drive level is constant.